Presenting Maze Runner #2 The Scorch Trials by James Dashner. Poor Thomas. And poor Gladers. They really can't catch a break can they. Aftermath of the Maze, their lives just went from bad to worst. The Maze trials may have been over but things are not done yet. The Scorch Trials come next. Out in this desolate danger infested world, the Gladers must journey across the 'Scorch' to finish the Phase 2 of the mysterious experiements. And WICKED is still upto no good and as mysteriously and condescendingly behind the scenes still. Thomas, Newt, Minho, Frypan, Teressa and all the other Gladers return for this next installment in the Maze Runner series. Conquered the maze they may have, journey the Scorch they must in a world infested by the Flare and get the supposed cure promised o them at the beginning. WICKED's intentions are still very much a mystery, raising even more questions thoughout this book than answering. The stakes too are greater, there was another maze. There is another group. All girls and just one boy. The Scorch was perfectly imagined amidst the author's words. There is literally nothing left. The heat of the sun is scorchingly unbearable. The nights offer the much needed respite, water is scarce and the storms are dangerously unpredictable. Lets also not forget the 'Cranks', those carrying the Flare in them. And they come in all shapes, sizes and degrees of madness. You can never know with Cranks and that was the best, intriguing and terrifying addictions to the story. Really no clue as to why people are giving this such low rates because it wasn't like that to me at all. Of course it is not on par with The Maze Runner but it comes close second to it. It held my attention and had me excited till the end. While keeping things close to the vest might be detrimental in the long run but Dashner keeps a well on the mysterious WICKED and I can quite agree that us readers (who haven't read the books yet) and the Gladers are more than ready to find out what the heck is actually going on ..... Of course the upcoming movie has us excited as well. "An intriguingly dangerous and emotionally turbulent sequel"
Finally, someone who liked the book. I've been wanting to read this series for a while but b/c of the low ratings I never did. I have only watched the movie and I'm really excited to see what happens next. Great review! 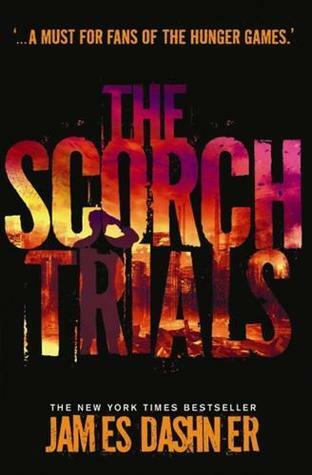 HOLY MOLY that is a GORGEOUS cover of the scorch trials! way prettier than the one i currently own (although i'm rather attached to mine since it's signed by dashner:) great review! glad you enjoyed it!